2010 has been a strange year, filled with new experiences, joyous moments and terrible losses. Thanks for reading my ramblings and looking at my photos. I'm glad that each and everyone of you have taken the time to visit my blog (even the spambots). I hope that you all leave 2010 in peace and start 2011 in health and happiness. For my last post of 2010 I wanted to conclude the year with a photo from my August trip to Paris. 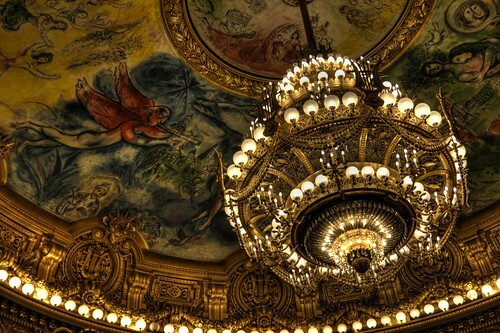 The domed ceiling of the Palais Garnier Opera House. One of the most beautiful theatres I have ever visited and an opulent tribute to the performing arts. Here's hoping 2011 is filled with beauty, love, rabbits and lucrative job opportunities (for me and for you). When I was a 19-year-old brat obsessed with The Phantom of the Opera and such, I made sure to make the opera house a primary stop on my week in Paris. I was very disappointed that they had closed the main theatre because of Paris Ballet rehearsals. As I was walking around upstairs, I noticed a door cracked in one of the VIP balconies. I got out my disposable camera, sneaked in, got down on my back and scooted to the edge. There was the famous chandelier. I came all the way down there to see that. As the ballet was rehearsing below, I took a big flash photo of the chandelier while on my back. I saw some other tourists peeking through the door and wandering in, and I promptly jumped up and ran out as the ballet director started yelling at the tourists for interrupting his rehearsal. That looks very much like the photo I took in 1993. Beautiful story Joe, thanks for sharing it. My visit there this year was one of the highlights of the year, such an extraordinary place. Like you, I did spend a certain amount of time on my back, photographing some of the ceilings, much to the amusement of the other visitors. Oh, yeah. I bought a paper model book of the opera house in the souvenir shop. It was my summer project, and it looked gorgeous. But it was impractical to keep in my college dorm room and wherever I went after that, so I think it's gone. It was cool because it was split down the middle with a cross section of all the nooks and crannies. That would have been fantastic to have. I'd like to go back again and spend a few more hours wandering the halls. I'm pretty sure that Marc Chagall was the artist who painted the ceiling...gorgeous!